Montrealers are digging out after the worst storm in a century dumped almost 25 centimetres of snow on the city. The blizzard is considered the worst combination of snow and cold Montreal has seen in 100 years. “More than 25 with the temperature not exceeding -15 degrees Celsius, we have to go back to 1920 to see a snowstorm like this,” said Environment Canada meteorologist Alexandre Parent. 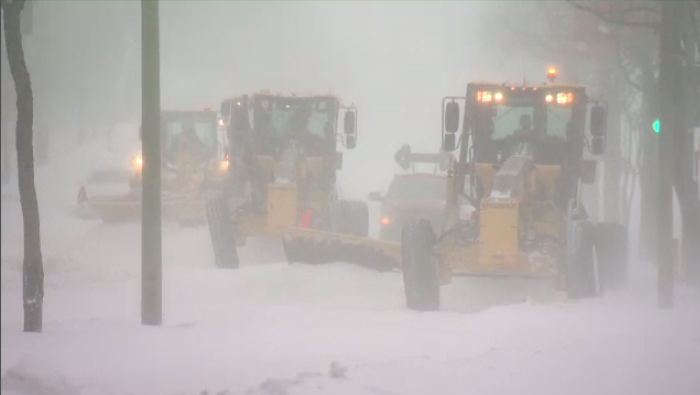 The City of Montreal says it is prepared to deal with the heavy snowfall - fleets of trucks and 3,000 municipal employees are now out on the streets. On Sunday night, a fleet of 1,000 snow plows started the job. So far, the focus has been on clearing the roads and sidewalks, but snow removal operations began at 7 p.m. on Thursday. City spokesperson Philippe Sabourin said it will be at least a week until all the snow is removed from the city's 10,000 kilometres of streets. The public should strongly consider commuting by metro and buses in the meantime, he said. Montrealers should pay extra caution to where their park their cars. According to the city, nearly 50,000 parked cars disrupt or delay the snow removal process each year. Temperatures had been bitterly cold much of the week, dropping steeply on Friday evening with a low of -21C, and -31C with the wind. Environment Canada says the weekend's storm is, by definition, a blizzard. “The timing – the cold snap we had on Saturday, and just a few hours after, a snowstorm – it’s kind of unusual for Southern Quebec,” explained Parent. “Dry snow easily lifted by the wind is causing blowing snow, the roads are difficult – the salt is not working in these temperatures – all these things are combined create a significant snow storm,” he added. “We're spreading rocks and salt on the roads but we know for sure the salt won't have an effect,” added Sabourin. Meteorologists and historians said this weekend's snowfall was the coldest snowstorm experienced by Montrealers in a century. On Sunday, temperatures were below -15C and snowfall accumulation reached 25 cm. According to the Twitter account YUL Weather Records, the last time Montreal experienced a similar snowstorm was on January 16th, 1920. On that day in history, a total of 30.2 cm of snow fell, and the daytime high reached -19.4. Environment Canada advised people to postpone "non-essential travel" until conditions improve, which may not be for a couple of days. "There is another storm that may be heading our way for the middle of the week, so we expect more snow," said Michelle Fleury, a meteorologist with Environment Canada. "But it won't be as cold as it [was Sunday.]" Environment Canada said January has the most severe temperature swings of any month, and that a deep freeze like this one isn't unusual. “Sometimes we get flow from the north and it's -20 and sometimes we get flow from the south and it's plus 10, plus 12 in January,” said Parent. The cold temperatures will stay until Wednesday. Environment Canada warns that until then, there's still a risk of frostbite. At the height of the storm, whiteout conditions on Highway 15 on the South Shore caused a multi-car collision involving two police cruisers. Luckily, there were only minor injuries. On Sunday, even some buses got stuck trying to manage on snowy Montreal streets. An STM bus carrying passengers on Pie-IX was hauled out by three other vehicles.